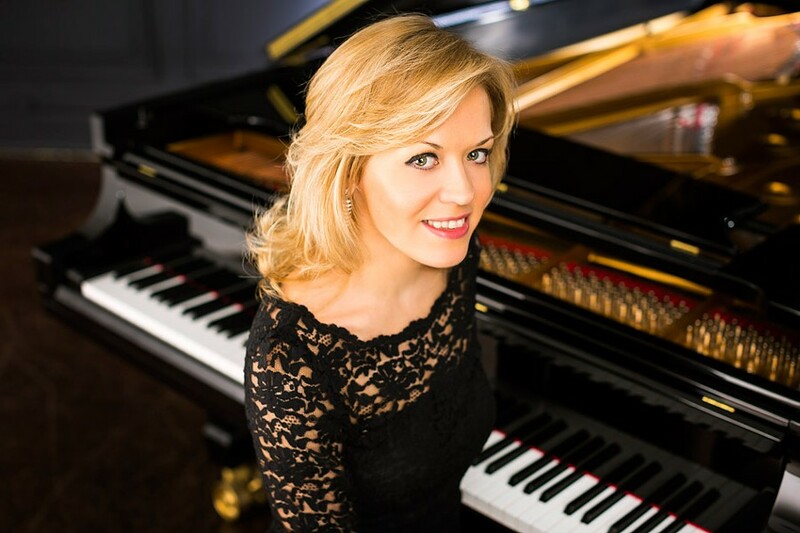 PHOTO BY CHRIS LEE Pianist Olga Kern will perform with the RPO again on Saturday, June 4. Ward Stare gives a great bacchanalia. A few weeks ago, Stare led a downright cheeky RPO performance of Saint-Saëns' Bacchanale from "Samson et Dalila," and for his first-season finale as RPO music director he began and ended the program with two more sumptuous French celebrations of bad behavior. This was an enticing program, but experiencing it could have been like eating four big slices of chocolate cake in a row. It was certainly a sweet evening, but thanks to Stare's lively tempos and sense of pace, and some outstanding orchestral playing, it turned out to be a nourishing meal, catered by the finest patisserie. Roussel (1869-1937) is one of those caviar-to-the-general composers whom a select few love, and whom nobody else has ever heard of. Too bad, as he is truly a French master; his ballet "Bacchus and Ariadne" is a masterpiece. The RPO was apparently playing this 85-year-old score for the first time, and played it wonderfully well under Stare. Roussel's orchestration varies from diaphanous to commandingly brassy; one moment it is as luscious as Ravel or Debussy, the next moment Roussel is pounding out Stravinskyan rhythms and indulging in deliciously acrid harmonies. "Bacchus and Ariadne" is a treasure trove of brief but telling solos for violin, viola, trumpet, and all the principal woodwinds. Roussel offers many arresting harmonic details and turns of phrase for players and the conductor to tease out, and Stare and the RPO dug into everything the piece offers. If you're a person of a certain age, you probably know Borodin's tuneful "Polovtsian Dances" as a source of music for the tuneful 1950's Broadway show "Kismet" (for which, I discovered, Borodin won a Tony Award 75 years after he died). Long before Broadway, it was a lively ballet scene (with chorus) in Borodin's opera "Prince Igor," and was considered the last word in colorful musical barbarism, at least until "The Rite of Spring" came along. It's still tuneful and colorful, though, and the kind of piece Ward Stare leads with great panache, having fun with the music and indulging in podium choreography without camping it up too much. This was a delightful performance from the orchestra, but not so delightful from the Rochester Oratorio Society, which was handicapped by some noticeably harsh sopranos and reedy tenors, a surprisingly thin-bodied sound, and a poor choral blend (amplification only made things worse). The chorus and orchestra were noticeably out-of-sync at the end of the piece. The ROS did somewhat better in the wordless "ahs" of Ravel's "Daphnis and Chloe," though amplification gave the combined choral-orchestral sound an opaque quality. (To be fair, this is very difficult to balance effectively, especially with such a large chorus; the suite is usually just played as an orchestral piece). The orchestra itself sounded splendid. The languorous beginning featured wonderfully precise and detailed playing from flutes and clarinets; Pierre Boulez himself couldn't have achieved more clarity in the opening bars. The woodwind playing was distinguished throughout, especially Rebecca Gilbert's rendering of the famous flute solo that leads into the finale. Stare drove the closing measures a bit too much for my taste, but this was after all a bacchanalian frenzy, and definitely exciting stuff. Rachmaninoff's highly caloric yet also highly disciplined "Rhapsody on a Theme of Paganini" turned out to be a perfect concerto to complement all this lusciousness. And Olga Kern was a near-ideal soloist for it. Her delicate frame is deceptive; she is a powerhouse virtuoso and this ingenious, diabolically difficult piece offered no problems for her. In fact, she was able to take some of the faster variations at such a clip that they were difficult to follow. Kern was in command of the piece's quick changes of mood, but she relaxed most satisfyingly for Rachmaninoff's famous 18th variation, turning it into a beautiful cameo with plenty of rubato and detail. She also gave a pretty stunning reading of Prokofiev's Fourth Etude as an encore.